Designed for an intimate close up show, this experiment apparently shows that a spectator has an excellent psychic sense as he achieves an impossible outcome using three pay envelopes and some ordinary coins. Apparently give a spectator psychic intuition. The magician shows three small coin envelopes. On the front of each envelope is attached a different coin. One envelope has a penny attached to the front, another has a nickel, and finally the last envelope has a dime. The magician says he has made a written prediction and points to it. It is on the table in full view. The coins on the envelopes serve to influence the spectator's intuition. He says he hopes the spectator's intuition will match his prediction. After the spectator has done this, the magician gives him a chance to change his mind and put the three coins on different envelopes if he wishes. The spectator has a free choice of which coin to place on each envelope, provided it is not a matching coin. There is no forcing or magician's choice of any kind. Once the spectator is happy with his final choice, he picks up each coin and puts it inside the envelope. The spectator does this, the magician does not touch the coins or envelopes at any time, eliminating the idea of sleights or coin switches. The magician says that inside each envelope he placed a hidden coin beforehand. He tells the spectator since there are three coins; a set consists of all three coins, the penny, nickel and dime. He says if the spectator used his intuition and put the correct coin into an envelope, then the coin attached to envelope and the two inside will make a perfect set. In other words, if the coin attached to the envelope is a nickel, then the two on the inside will be a penny and a dime. This would be a coincidence, if he formed a set. The magician shows the prediction and reads it, it says: I predict using your intuition, that you will have created three sets. The spectator (not the magician) then opens each envelope and dumps out the contents. Amazingly, using his intuition, he has put the correct coin into each envelope needed to make a set. Each envelope contains a penny, nickel and dime. This is an amazing feat in itself. Had the spectator placed a different coin into the envelope, which he could have, then there would not be a set of three different coins. Must have been psychic intuition! Not only has spectator done an amazing coincidence, but the magician has correctly predicted the spectator's actions beforehand. Believe it or not, this is a 100% hands-off effect. The magician just directs from a distance, with the spectator doing everything. This is close-up mentalism that is a real fooler and requires no skill or sleights. This is so easy to do that you will amaze yourself. This is a self-working effect that uses no gimmicks. Both the envelope and the coins are ungimmicked. Everything can be examined at the end. 1st edition 2016, 7 pages. I have to say that this is easy to do, without slights, and it can be done as soon as you have the proper coins and envelopes. This is a good one that will not end up in a drawer. 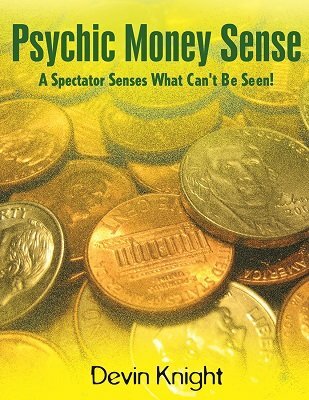 Money Sense allows you to show that the spectator has paranormal powers in relation to money. To prove this, the magician presents the spectator with a test where the spectator needs to put certain coins into specific envelopes. There is a correct arrangement, and the single prediction put on the table when it is read at the end, foretells the arrangement that the spectator made, and proves that he has psychic powers. This is actually a good put-in-your-pocket trick, because you could do it anywhere. While the spectator is arranging coins and envelopes, there is a lot of suspense before the prediction is read. This is a quickie trick that's kind of a throwaway, so much so that even Knight suggests it as a prelude to one of his Blind Sight effects. It's about as self-working as they come, and you really only need to remember one thing. It reminds me of something that would be one of eight or nine tricks in a Conversation as Mentalism volume by Mark Elsdon. In other words, you might do this in a bar or as "B" filler material for close-up. There are only two ways this trick can end: Two out of three times, you'll get a certain outcome and the third time a different one. (It will be strikingly obvious how this plays out once you read the instructions.) The principle involved is actually better than the trick, I think. So if you want to spend your Starbuck's money today on a little mentalism, you could do worse.